For the past few months, we have been highlighting General Plastics’ value-added services. In addition to producing high-performance rigid and flexible foams, we also deliver end-to-end project solutions. 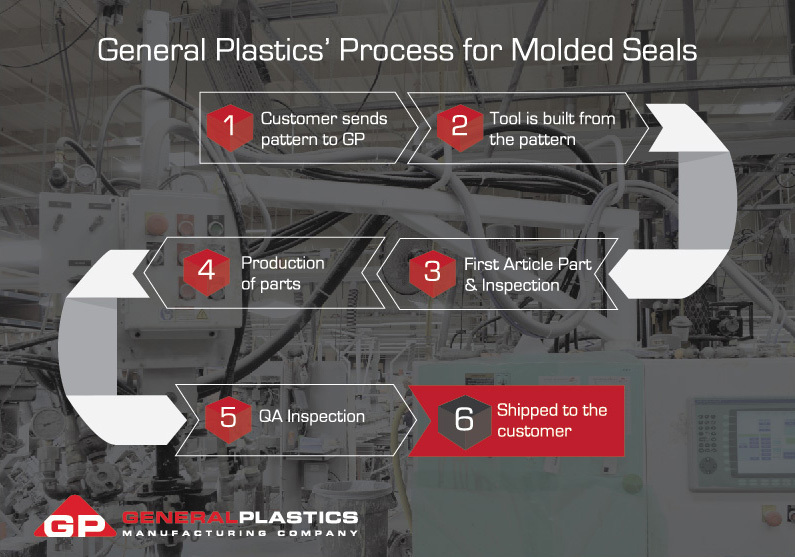 This is the first of a two-part series on another General Plastics capability, our molded parts program. Divided into two main areas, Molded Seals and Padded Parts, our molded parts program produces build-to-print parts that are durable and conform to customer’s exacting specifications. This includes creating the molds, trim fixtures and final assemblies, a true full service offering. These are manufactured from our flame-retardant, self-extinguishing, self-skinning foam that meets FAR 25.853 standards. In this installment, Luke Bullinger, Daniel Wermuth, and Tammie Carney, plant supervisors, answer some commonly asked questions. Q: Our molded parts program includes the production of gap seals, trim pieces, flight deck components and other build-to-print parts. How would you describe what your department does? DW: We make over 1,500 specific interior parts for the aircraft of our customers. These parts cover areas that would otherwise be exposed to the internal shell and wiring of the aircraft. We start with detailed instructions that specify the required dimensions to sixty thousandths of an inch. We create parts that vary in size from one inch wide to eight feet long. LB: The whole process includes a quality process to address any imperfections and create a part that meets the customer’s needs. Q: You mentioned foam formulation. How do you determine what foam formulation to use for a specific part? TC: We start by finding out what the customer’s needs are. LB: It has to meet their need for compression, flexibility and other requirements. TC: It’s a density range too. It has to be within a certain density. If there’s not enough foam, the parts will not have the needed strength. If you put too much foam, the resulting part will be overweight and very hard, lacking flexibility. DW: We have a team of chemists with PhD’s in their field. They help us create and maintain the perfect formulation to create a foam part with the customers’ specified dimensions and mechanical properties. The customer dictates the size, color, shape, and texture; we find the perfect formulation to meet their specific application. Q: What is the general process for creating the gap seals or trim pieces? TC: Usually the customer sends us a pattern, typically created using 3D printing or stereolithography. We take that pattern and build a tool around it. LB: The mold is the exact replica of the product that the customer needs, so the first thing we do is run two to three test parts to verify that the mold is accurate, these are called First Articles. DW: When the customer decides on the design and requirements for a part, a mold is created with those specifications. Once the test parts are verified as accurate, we are then able to make thousands of parts from that mold. We complete this process every time a new mold is made or if the part has not been made in two years. After the part is initially made, the part goes through a six part conditioning and quality verification process before being processed for shipping. Q: What appearance attributes can be applied to the gap seals and trim pieces? TC: One is texture. This is added to the mold so every time we use this mold, we will always get the desired shape with the desired pattern. In addition, other details are added to the part, such as profile extrusions, clips, hook and loop, brackets, mounting fasteners, etc. Some of these finished parts are very complex. LB: For the vast majority of the parts, and almost in their entirety, they’re molded with texture in place from the mold itself. That is one of the benefits of our process; the texture is part of the foam surface. We don’t have to recreate the texture every time. So it allows us to produce the part consistently. The customer can also specify the paint color. Q: How does GP ensure that parts going out the door are always of the highest quality? LB: It starts with the tool. Every single mold for every single part goes through a First Article inspection to confirm the mold is correct and will produce the product the customer is looking for. About two or three parts are produced, and these are sent to our Quality Assurance department. The QA department conducts an extremely thorough check of the part, cutting cross-sections, checking every dimension, to make sure that it conforms to the customer’s requirements. When it goes into production and the parts are produced, every single gap seal goes through a thorough inspection. These are examined to the drawing to ensure they match color, sheen and dimensional requirements. DW: I mentioned the six part conditioning and quality verification process earlier, which happens after the part is produced. This includes inspections for voids, reworking any repairable flaws, and then QA completes one last thorough inspection before allowing the parts to be processed for shipping. TC: At this point it’s more of a visual inspection. Once the tool is approved, the dimensional requirements will always stay consistent. It’s all visual, which includes making the pull on the extrusion to make sure everything is locked in place, and other details after that. Q: What makes GP’s molded parts program different from other companies? TC: I would say our responsiveness to requests as well as the quality of the parts we produce, which starts with the foam. Our flexible foam is flame-retardant and durable. Because we produce our own foam, we have all the testing records. Added to that, the company is AS9100 certified. LB: I would say easily, just the solutions that we can provide in the time that we can provide it. We receive a lot of challenging requests, whether in terms of configuration or timing. We have an amazing group that is able to respond to that and turn products around in the time needed. And on the other side, with very complex requests, we have a really good group of estimators and production operators who get together and assess the risks and how to mitigate them to meet our customers’ needs and timing. And we can provide an accurate assessment to the customer showing what we can do, what the challenges may be and how we can find a good solution. TC: With all the various configurations and colors and details that go into it, there’s no gap that can’t be filled, from something as small as 15 grams of foam to the biggest part, which could be 1000 grams. We can handle different variations of shapes, sizes, colors, and mix in all the details that are bonded on to them too. And at every step of the way, QA is involved to ensure that that every single gap seal and trim piece produced satisfies the customer’s requirements. For more on our molded parts capabilities and facilities, click here.